Michael Stark is the Executive Producer of the Truth & Life Bible. The Truth and Life app. 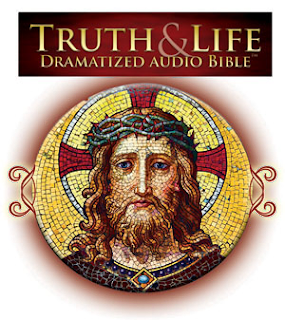 is a free download that has taken the award winning Truth & Life Dramatized New Testament audio and synchronized it at verse level to the RSV-CE Bible text. This amazing audio brings the word of God to life in this 22-hour audio production, complete with movie-quality sound effects and an original music score. This award-winning audio New Testament is endorsed with an Imprimatur from the Vatican and including a foreword by Pope Emeritus Benedict XVI. Voiced by internationally-renowned actors including: Neal McDonough, Stacy Keach, Kristen Bell, Sean Astin, Michael York, Blair Underwood, Malcolm McDowell, Brian Cox, Julia Ormond, John Rhys-Davies and many more. 1) I wanted to start off with a question about your personal involvement with Sacred Scripture. How has Scripture played an important role in your prayer life? Has it always been that way? Over the last 5 years I have grown in the sacred scripture immensely. I have always loved the Lord and been faithful to the Catholic Church. Growing up, it just seemed to be something that was there, but I wasn't really dialed into it. I glossed over CCD and the Mass as a kid. I took it more seriously after getting married and having my daughter. Now I go to daily Mass and pray the Rosary 4 times a day. 2) Why do you think the daily reading of Scripture is such an important part in the life of a Catholic? I post the daily Gospel on my Facebook page everyday. People can't wait for me to post it. Some people in Europe have asked me to post it before I go to bed the night before, because when I wake up in Chicago, their day is half over. It's VERY important to have daily contact with GOD! We need to know what he is saying to us. If we are out of touch, we are lost, in every way! To me it seems as if Protestants are much more focused on the Bible than us Catholics. That is a shame, because Catholics wrote the book. 3) Could you talk about the Truth and Life Bible? How did it come about? The Truth & Life Audio Bible came about when my best friend and business partner Carl Amari went over to Rome to visit his friend Jim Caviezel during the filming of The Passion. They discussed the idea of creating an audio Bible. Carl has been in the audio production business since he fell in love with the old radio shows from the 30's and 40's in high school. He actually bought the rights to the old shows and re-mastered them for radio shows and CDs for a new audience today. Nobody would fund a Catholic Audio Bible, so he asked me. I thought we Catholics could use some "New Evangelization", so I said yes. I am adopted out of a Catholic orphanage, so I thought I should give back. I am so glad we made T&L because it is truly changing lives and bringing people to the Bible in a whole new way. Remember, scripture was originally spoken. It took several hundred years before printing was invented. 4) What are some of the features of the Truth & Life Bible and App?
. Complete text of RSV-CE synchronized with audio for the New Testament.
. An amazing search tool, which gives you a concordance for any word or phrase you select.
. Direct, instant access to any Bible verse, so you can hear and see the text instantly.
. Footnotes for the underlined words and people in the context.
. A built-in playlist to listen to the whole New Testament in just for 40 days or in Chronological order.
. Create your own playlist of verses.
. Remembers where you left off. 5) For someone who might be content with their standard printed Bible, how would you encourage them to try out something like the Truth & Life Bible? It was said by My good friend Archbishop Listecki (Milwaukee) "The Truth & Life Audio Bible puts you among Jesus and the apostles. It is as if you were following them around with a boom microphone. The music and sound effects take you right into the scene." Many have told me they feel like they know Jesus because they are used to hearing his voice, instead of reading. Everyone who listens has a completely different picture in their minds. But everyone is definitely in a very good place. With the app. you can do both. The text is highlighted as the audio progresses. Romans 10:17 So faith comes from what is heard, and what is heard comes by the preaching of Christ. Saint John Paul II said "The question confronting the Church today is not any longer whether the man in the street can grasp a religious message, but how to employ the communications media so as to let him have the full impact of the Gospel message." I think T&L follows his suggestion quite well. 6) How can one get started with the Truth & Life Bible App? What do you need and what are the costs? You can download the content for FREE, including the audio and Ignatius Study Bible contents in Mark's Gospel. The additional 20 hours of audio and Ignatius Study Bible content is $19.99 each, or combined for $29.99 on up to 5 devices. The main goal is to share the Bible with everyone. In the future we hope to make a Spanish version. Please share this. The sooner we recover our costs, the sooner we can start making the Spanish version. 7) Could you share with my audience your favorite verse or passage from Scripture? Luke 4:24 And he said, "Truly, I say to you, no prophet is acceptable in his own country." I have met so much apathy & ignorance when it comes to sharing the Truth & Life Bible with Catholics. I thought it would be loved by everyone. You can listen instead of reading. A FREE app., still many could care less. I believe the trend is changing, hopefully sooner than later. It truly is an amazing feat: an actual audio New Testament (i.e. read word for word from an approved Catholic translation), but fully produced a listening theater (distinct voice actors for every character, sound effects, and musical cues). I've listened to it many times as it comes with the Lighthouse Catholic Media Catholic Study Bible app pegged to the Ignatius Bible commentary. Did you ask if any plans to release an Old Testament version? We would love to do the Old Testament, as well as a Spanish version. There is actually a partial Spanish version on our web Bible. However, we have had very few downloads of this version, we can't afford it. I hope someday, when the word gets out about Truth & Life, we can continue to produce more audio Bibles. God Bless you. Please share. that the word of promise audio bible with Jim cavaziel fresh off the Passion came out and obliterated all other audio bibles. I happen to really like the truth & life audio bible but the word of promise is a step up on my opinion both in the voices and the music. And they also have the full bible available (albeit in the nkjv and therefore incomplete). Also the use of the RSV with the retention of the thees and thous in the parts of scripture where they are praying sounds weird when the rest of the dialog is in somewhat modern English. And lastly, we all know all too well that most lay Catholics do not read their bibles, so how much less so will they purchase/listen to an audio bible?? I think the only market for this in the catholic world is Catholics who already read their bibles. And as I stated above if I had the choice between the truth and life NT and the word of promise NT I would choose the Word of promise NT. I need to sort of amend something here... I realized that my post sounded like I was getting down on the T&L audio bible and that's not fair because it really is a fantastic audio bible!!! Had I never heard the word of promise audio bible I'd be singing the praises of this bible (and still am to a certain extent). My comments were more directed towards why I believe the T&L audio bible didn't gain the traction it should have. On a side note: the imprimatur - was it granted specifically to this audio Bible, or is the claim based on the original imprimatur of the RSV-CE? If it was granted specifically to this translation by the Holy See, then wouldn't that make this one of the only (if not THE only) Catholic Bibles in English directly approved by the Vatican? Agree with the issue of the Thees and Thous: that's the cost of using the RSV-CE. The nkjv is an excellent translation and the word of promise audio bible is the nkjv and Raymond orroyo co produced it. An imprimatur (for example the nabre) but not for the nkjv will NEVER make me choose the nabre over a better translation like the nkjv. These other translations simply never sought imprimaturs. I love the T&L audio Bible! I bought the CDs when they first came out and now I use the app on my iPad and iPhone. I have used this audio NT in my Bible study class and my RCIA sessions since it was first released! I have listened to the audio Bible regularly since the 1970s when it was available on cassette tape, and later on CDs, having listened to various renditions of the NASB, KJV and NIV before I became a Catholic. But I personally prefer straight reading of Scripture over dramatized versions, so I am not stuck with the emphasis or emotions of any particular actor. Several parts of the Truth and Life version make me cringe; for example, I think their Jesus gets overcome with emotion too often, and James sounds like a kid. On the other hand, I love the voice of Luke, Paul and the writer of Hebrews. I currently listen to the Douay-Rheims read by Steve Webb who does a good job at reading it in a straightforward, non-distracting way. Has anybody listened to the RSV-CE audio NT read by Mark Taheny? I'm considering getting that one in the future but I have found no reviews of his reading style so far. Mike, the most common problem I encounter in using the app is that the verse order in Esther. As per the print edition, it must have been starting from 11:2, and not 1:1. Thank you Mike! I think the app is going to make it easier for people to get T&L. People in my RCIA class liked the audio CDs but they cost more and you needed a CD player of some sort, not as practical. Now when I use the T&L app in class, people buy the app right away! I also like that the text of the RSV-2CE (with study Bible notes) is included with the text of the RSV-CE. I like to listen to the audio (RSV-CE) and compare it to the text of the RSV-2CE to see the changes. I would like to point out several of the free links are great. Fr. Barron's Word on Fire, Jeff Cavins' Great Adventure, CNA, & in my opinion the most important, Fr. James McIlhone's Word Made Clear. He explains the Biblical origins of the Mass & the Gospel authors biographies. Thank you all for your comments. We learn how to improve by others ideas & critiques. I didn't know that there was an app version of this audio Bible! I just picked up a copy. I think that this app + a Bluetooth speaker will be a big hit in my R.E. class. Thanks, and God bless y'all! Lossbio, my son bought me a bose single speaker last Christmas which works great with it! There are several copies available for purchase at various Half Price Books (they're having a 20% sale this weekend). Also, some of them have Jerome Biblical Commentaries for sale, and I saw a New Jerome Biblical Commentary in one store. The one in Richardson has the 1953 A Catholic Commentary on Holy Scripture. Not only is there an app version of the audio Bible, the Catholic Study Bible app from Ignatius Press + Lighthouse catholic media combines the audio NT with the RSV-2CE text and Ignatius Bible commentary! It's incredible: you can listen to the audio NT, and read along in the text, clicking through to all the hyperlinked commentary from the Ignatius Study Bible as you go. Can I read the whole bible in this app without spending any money or am I purchasing stuff without realising? Anonymous, yes the whole text (OT&NT) of the RSV-CE and 2CE are in this app! The audio is the NT only and the study notes (ICSB) are included for the NT and a few of the completed books of the OT. This app is well worth it!